As I travelled across Europe, I spent plenty of time exploring the metro networks of each city I visited. I’m not sure how I did it, but I managed to avoid the overcrowded peak hours, at least until I visited Bucharest – capital of Romania. That the first section to open should be Semanatoarea to Timpuri Noi says much about the original purpose of the metro. As visitors to Bucharest are amongst the first to notice, the metro isn’t all that useful for traveling around the city centre. Damn right it isn’t: that was not what it was built for. That’s why so many stations on the system (and almost every end-station) are (or at least were) home to an enormous industrial plant: Republica, Industriilor (now Preciziei), IMGB (now Berceni), Pipera, Semanatorea (now Petrache Poienaru), Timpuri Noi, Politehnica and Grozavesti. 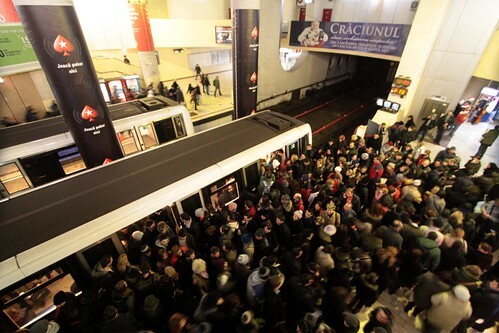 The Bucharest metro was overcrowded on Wednesday, January 29, as more people chose to commute underground, to avoid the snow-covered routes across the Romanian capital. 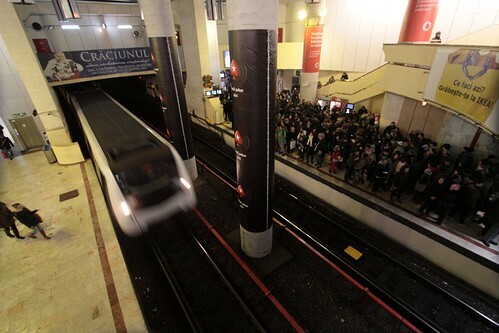 The Bucharest metro transported 1.7 million passengers, three times more than the daily average, according to data from the metro operator Metrorex. Metro train traffic was however normal, and where needed, Metrorex added additional trains on the route. 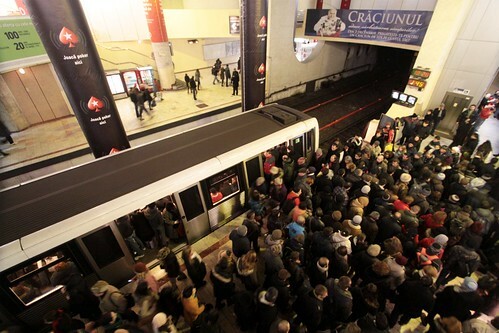 There were 27,800 passengers at the Piata Unirii 1 metro station on Wednesday , and 26,000 at Ppiata Unirii 2, a similar number to the one at Universitate. Piata Sudului and Crangasi metro stations saw a similar number of commuters. 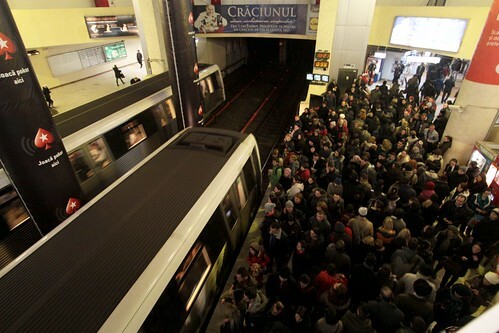 Conditions on the metro are marginally better than on surface transport, but here too overcrowding is a serious problem, not only on trains themselves but also at the interchanges at Piata Unirii and Piata Victoriei. To pass through the passage at Unirii between the two metro lines or the steps at Victoriei, it is commonplace to have to stand in a queue, waiting for those ahead to get through, particularly when two trains have come in at once. The solution to this overcrowding in the stations and on trains is to increase frequencies. This should have been easy, as a golden opportunity was presented by the acquisition of new trains. The metro authority could simply have kept more of the old ones going, so that more trains could run in the peak periods. Instead, intervals of up to ten minutes even in rush hours are not uncommon, particularly on the Dristor-Republica route. Some improvements to frequencies have been promised soon, but it remains to be seen how this will work out in practice. 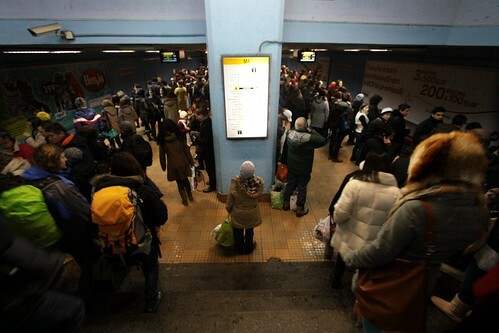 I just so happened to visit Piaţa Victoriei station in peak hour, and found the aforementioned crowding. Platforms were full of waiting passengers. And the interchange passageways were busy. But the main crush was on the Line 2 platforms. As each train pulled into the platform, the crowds would surge forward. With disembarking passengers struggling to make their way out of the train and onto the platform. Dwell times blew out to over 45 seconds, as intending passengers were finally able to board the train. Thankfully the train towards my hotel was in the opposite direction, so I was able to avoid the crush! This entry was posted in Trains and tagged Bucharest, Bucharest Metro, metros, Romania, underground. Bookmark the permalink.